This illustrated article provides interesting facts, information and a history timeline of the Native American Indians of North Dakota. The climate, land, history, environment and natural resources that were available to the indigenous Indian tribes in North Dakota resulted in the adoption of the Great Plains Indians culture. Discover the history, interesting facts and information about the way of life of the North Dakota Indians before the arrival of the white European settlers and colonists. 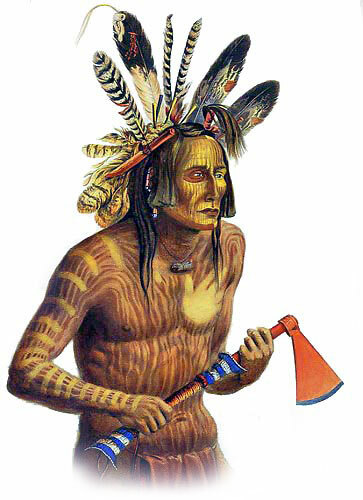 The American Native Indians who lived in what is now the present state of North Dakota led a Stone Age lifestyle - they only had stone tools and weapons, had never seen a horse and had no knowledge of the wheel. The history of the North Dakota Indians are detailed in this article. The map of North Dakota provides a bird's eye view of the location of the tribal territories and homelands of the North Dakota Indians in relation to the present day United States of America. The map indicates the location of the State and the American Native Indians of North Dakota. 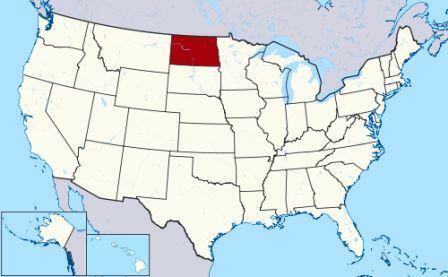 North Dakota is a state of the north-central United States bordering on Canada. There are many famous Native American tribes who played a part in the history of the state and whose tribal territories and homelands are located in the present day state of North Dakota. The names of the North Dakota tribes included the Arapaho, Arikara, Cheyenne, Chippewa, Crow, Dakota, Hidatsa and Mandan (see above picture). Indian Territory was a vast area of U.S. federal territory on the Great Plains reserved for Indians from the 1830s to the 1880s. In the 1870's the deliberate great slaughter of the northern bison herds began designed to prevent the Native Indians continuing the Great Plains lifestyle. Indian Territory eventually became the states of Kansas, Nebraska, and Oklahoma. By 1907, when Oklahoma was admitted as a state, Indian Territory ceased to exist. The way of life and history of North Dakota Indians was dictated by the natural raw materials available in the State of North Dakota. The natural resources and materials available provided the food, clothing and houses of the North Dakota Indians. Fast facts about the history, culture and life of the State of North Dakota Indians. Discover facts and information about the history of the State of North Dakota Indians. The history and the way of life of North Dakota Indians was profoundly affected by newcomers to the area. The indigenous people had occupied the land thousands of years before the first European explorers arrived. The Europeans brought with them new ideas, customs, religions, weapons, transport (the horse and the wheel), livestock (cattle and sheep) and disease which profoundly affected the history of the Native Indians. For a comprehensive History timeline regarding the early settlers and colonists refer to the Colonial America Time Period. The history of the State and of its Native American Indians is detailed in a simple History Timeline. This North Dakota Indian History Timeline provides a list detailing dates of conflicts, wars and battles involving North Dakota Indians and their history. We have also detailed major events in US history which impacted the history of the North Dakota Indians. The Dakota, Lakota, and Nakota are collectively called Sioux. The Sioux, Assiniboine, Cheyenne, Mandan, Hidatsa, and Arikara were the first Indian inhabitants. The Chippewa (or Ojibway), Cree, Blackfeet, and Crow moved to the area in the 1800's. 10,000 BC: Paleo-Indian Era (Stone Age culture) the earliest human inhabitants of America who lived in caves and were Nomadic hunters of large game including the Great Mammoth and giant bison. 1876: 1876 - Battle of Little Bighorn, Montana. Sioux and Cheyenne defeated General Custer and the Seventh Cavalry. 1878: 1878-1879 -- Campaign against Cheyenne Indians in Dakota (Territory) and Montana . 1890: Battle of Wounded Knee - Ghost Dance War (1890–1891) aka Pine Ridge Campaign. The Wounded Knee Massacre in South Dakota followed the killing of Chief Sitting Bull. Chief Big Foot led the last band of Lakota Sioux and were massacred by the US Army at Wounded Knee Creek. The history of the European invasion brought epidemic diseases such as tuberculosis, cholera, influenza, measles and smallpox. The Native Indians of North Dakota had not developed immunities against these diseases resulting in huge losses in population. Exploitation including the leverage of taxes, enforced labor and enslavement were part of their history, taking their toll on the North Dakota Indians. State of North Dakota Indian History. Discover the vast selection of pictures and videos of Native Americans. The pictures show the clothing, weapons and decorations of various Native American tribes that can be used as an educational history resource for kids and children. We hope that this article on the History of North Dakota Indians will assist in your studies or homework and that you will enjoy watching the videos featuring many pictures of the Native Americans. A great historical educational resource for kids on the subject of the History of North Dakota Indians..